SHOULD YOU CLEAN CARPET YOURSELF? 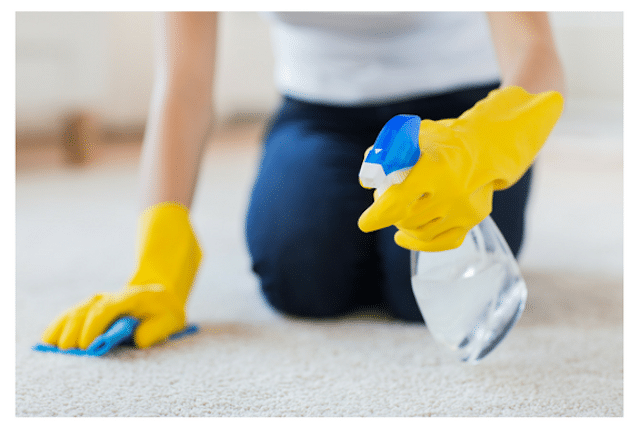 There’s no avoiding spills or stains or just plain old dirt when it comes to owning carpet and you’ve probably wondered if you can just clean carpet yourself. There are several stain removal methods and ideas you can find online. Some will instruct you to use cleaning products or chemicals from the store while others recommend more natural solutions like lemon juice or vinegar. There are even some websites or amateurs that recommend using a hot iron or peanut butter or hairspray to remove stains. All of these items and solutions can actually cause even more problems than the original stain. The problem is that different carpet fibers react differently to various solutions and the ingredients of the stain matter too. There is no way to inspect the stain and the fiber without seeing it in person. It is fine to use water to clean most carpet stains but not all. Vinegar or lemon juice might work for some stains too, but not all. This is why it is best to trust Fort Wayne carpet cleaning companies to clean carpet. Most local carpet cleaners staff certified technicians that know the proper methods necessary to safely and successfully remove stains from carpet. You might also be tempted to rent carpet cleaning machines and deep clean carpet yourself. Rental carpet cleaning machines are not as powerful as professional equipment. These machines also require a lot of soap and you have to purchase chemicals for the machines too. There is the possibility of using the wrong chemicals or too much of them. Once again, professional carpet cleaning services know the best solutions to use and how much of it to use. You can clean carpet yourself. But should you? Chem-Dry of Fort Wayne carpet cleaning service staffs certified technicians trained in both Chem-Dry equipment and solutions. Our service is 100% safe for your carpet and your home. It requires no soap or chemicals and is extremely successful in removing dirt and spills and stains from carpet.